These Parmesan Crusted Pork Chops are easy, delicious and coated in breadcrumbs, Parmesan cheese, paprika, parsley, and garlic making them very flavorful and perfect for dinner. Recipe courtesy of Lil Luna. 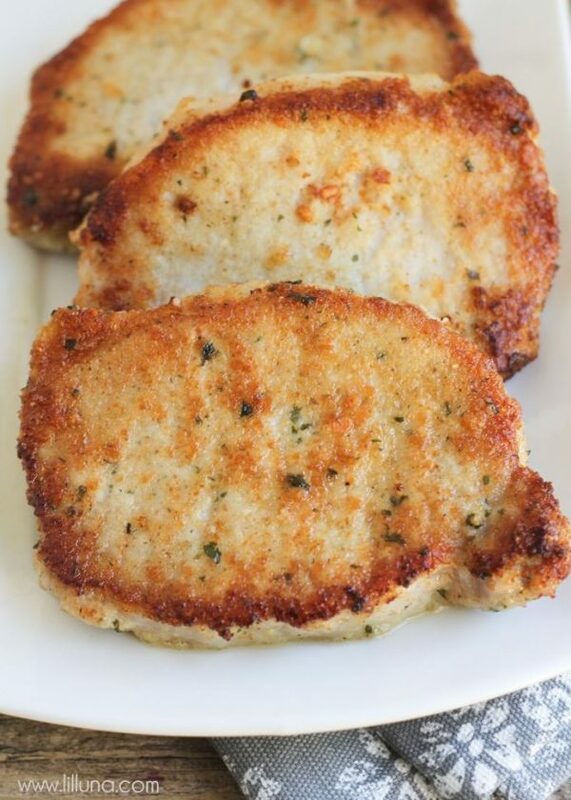 These Parmesan Crusted Pork Chops are easy, delicious and coated in breadcrumbs, parmesan cheese, paprika, parsley, and garlic making them so flavorful and perfect for dinner. Mix Parmesan cheese, bread crumbs, paprika, parsley and garlic powder and place on a plate. Dip pork chops in the mixture (making sure mixture sticks) and sear in a pan of olive oil on medium-high heat. Saute for 5 minutes on each side. Place pork chops in a glass baking dish and cook according to thickness. An inch thick, cook for an hour at 300. Regular thickness, cook at 350 for half-hour.